In this tutorial, I’ll describe how a customer support chat app can be achieved using React and Chatkit. In order to answer your customers’ questions about your product, there must be some sort of support system in place. If you’re looking to get a chat system up and running for the purpose of helping customers and tending to their needs, Chatkit makes it easy to do with just a few lines of code. To follow through with this tutorial, you need to have Node.js (v6 and later) and npm installed on your machine. If you need to install or update your Node version, you can check out this page for instructions on how to do so. Previous experience with building Node and React applications is also assumed for the purposes of this tutorial. Open this link to create a new Chatkit account. This is a necessary step so that you can create a new Chatkit instance for your application and manage your credentials. Once you’re logged in, create a new Chatkit instance for your application, then locate the Credentials tab on your instance’s dashboard and take note of the Instance Locator and Secret Key as we’ll be using later on. Next, cd into the new customer-service directory and initialize your project with a package.json file using the npm init -y command. The -y flag allows us to accept all the defaults without being prompted to change the values. Following that, run the command below to install all the dependencies that we’ll need to build up our Node server. The @pusher/chatkit-server package is the Node.js SDK that grants us the ability to make use of Chatkit features in out application. When a customer tries to contact support, we will request the name of the user which will be used as their userId. 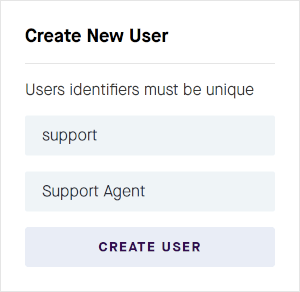 The userId is passed to the /users endpoint so that a new user account can be created on the Chatkit instance with the provided ID if it doesn’t exist already. The other route, /authenticate, is used to authenticate users who try to connect to your Chatkit instance. I’ve opted not to include an authentication flow in this example so that anyone who tries to contact a support agent would be granted access immediately. That’s all we need to do on the server. You can start the server by running node server.js to make it available on port 5200. 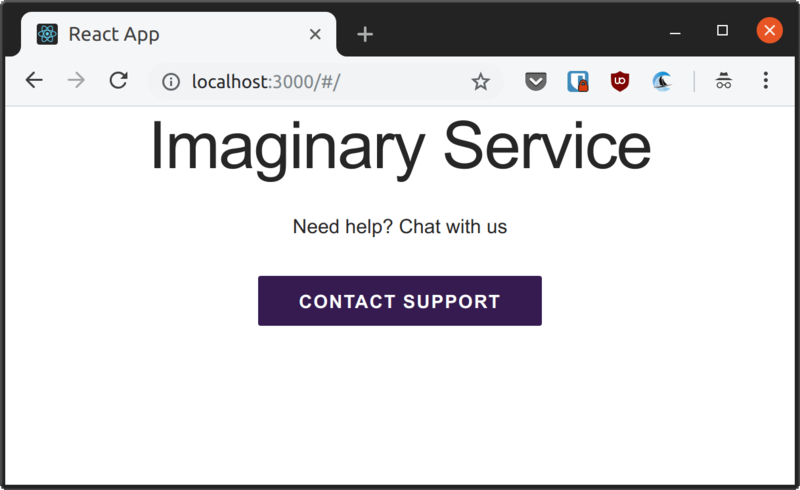 Upon the installation of the above dependencies, run npm start from within the client folder to launch the development server on http://localhost:3000. We installed the react-router-dom package in the previous section for the purpose of adding routing to our application. We’ll have two views in the app: the customer view which will be loaded on the root route, and the support view will be loaded when the user navigates to the /support route. At the moment, an error is displayed on the page because, we imported and used the Customer and Support components within App.js, they haven’t been created and exported yet. The Dialog component takes three props: username which is the name the user enters in the input, handleInput which updates the username as the user types and launchChat which will connect to our Chatkit instance once the .dialog-form is submitted. All of the above will be passed down as props from Customer.js. Create the handleInput method in a new file called sharedMethods.js. The reason for this is so we can avoid repeating the same code in multiple places since we’re going to make use of it in the Support component as well. Once the button is clicked, the showDialog() method toggles the value of isDialogOpen to true causing the dialog to show up on the page. The user can then enter their name into the input field and submit the form to launch the chat session. The launchChat() method will take care of that part for us, but right now it only prevents the form submission from reloading the page. What it needs to do is connect to our Chatkit instance and open up the chat widget so that the user can begin to chat with the customer service agent. Be sure to update the <your chatkit instance locator> placeholder within the launchChat() method before proceeding. If you open the app the browser, you should be able to enter a username, and see the chat widget popup. You should also be able to send a message and see it display on the screen. Let’s walk through the huge chunk of code we’ve just written so how everything is achieved is clear to you. In Customer.js, we imported the Chatkit client library and made use of it in launchChat() method to connect to our Chatkit instance. If the connection is successful, we receive a currentUser object which is stored in the application state. This currentUser object is the primary interface to interact with Chatkit. Immediately following that, we create a new room for this interaction via the createRoom() method. We’re choosing to make the room private so that it’s not publicly available to anyone. Once the room is created, we have to connect to it before we can send any messages. This is done via the connectToRoom() method which takes the id of the room that was created and adds the user to the room. Chatkit’s room subscription hooks allow us to perform actions when some event occurs in the current room. Here’s we’ve set up the onMessage hook to append new messages to the messages array so that the new message is displayed in the chat widget. The support agent needs to be able to interact with multiple customers at once, so we have a sidebar where all the rooms are listed and the main chat area for sending and viewing messages. We’re immediately connecting to the Chatkit instance on page load (via componetDidMount()) and listing all the connected customers in the sidebar. We can jump between chats by clicking on each room name which triggers the joinRoom() method. This method simply connects to the selected room and changes the value of currentRoom so that the screen is updated appropriately. And due to the onAddedToRoom() connection hook, we do not need to refresh the page to see new chats that have been initiated. Everything is updated in realtime without much effort on your part. In this tutorial, we went through how a complete customer service solution can be built with React and Chatkit. Although we wrote a fair amount of code, none of it was particularly complicated since Chatkit does all the heavy lifting for us.